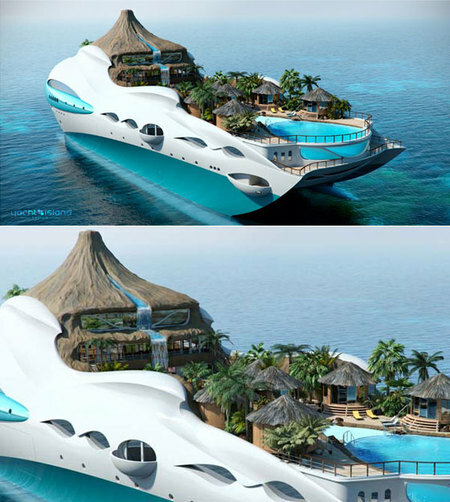 If we ever win the lottery, you'd better believe we'll be purchasing an amazing dream yacht! Here are some beautiful and impressive designer yachts to put on your wish lists. 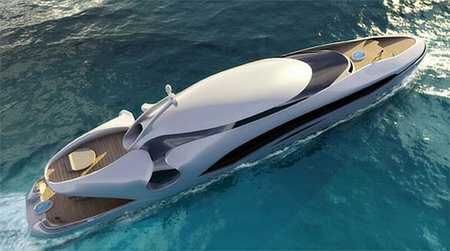 This is a prototype for a yacht to be built by U.K. company Yacht Island Designs. Boasting four VIP guest suites and an incredible owner's suite built into the volcano, the yacht is equipped with luxury features like a cinema, library, game room, gym, and sauna. The exterior main deck includes the swimming pool, guest cabanas, the bar and outdoor dining. The waterfall flows from the volcano into the swimming pool. Planet Sola has created a solar powered yacht called the Turanor. 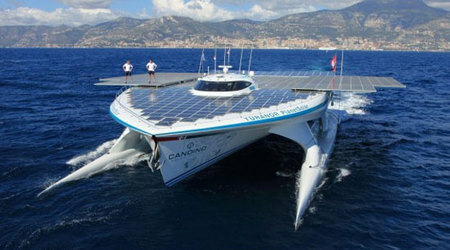 This is the largest solar powered boat ever to set sail. 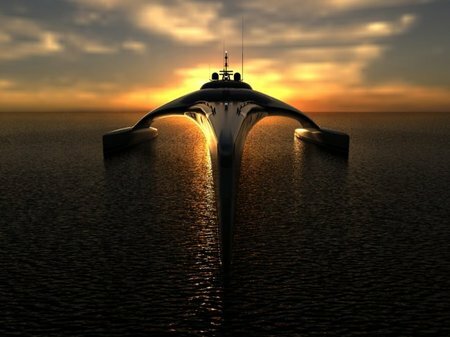 It is 8.5 tons and can store up to three days of sailing power in lithium ion batteries, allowing it to sail at night. Yes, there's an app for that! The Adastra is a 139-foot powered trimaran yacht designed for long distance cruises around the Pacific. Along with its countless other modern features, key functions of the Adastra can be controlled through a custom app for the iPad. The ship took more than five years to build and cost over $15 million. Currently the most expensive yacht in the world, the estimated cost of the Eclipse is about $800 million. Owned by 44-year-old Russian billionaire, Roman Abramovich, the yacht features two helicopter pads, 24 guest cabins, two swimming pools, several hot tubs and a disco hall. 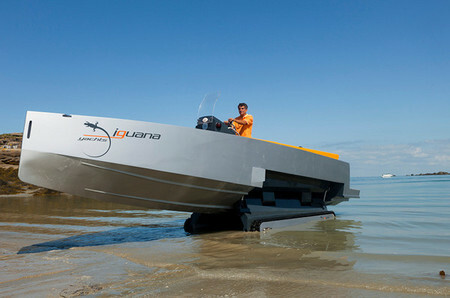 It is also equipped with three launch boats and a mini-submarine that is capable of submerging to 50 metres. Approximately 70 crew members are needed to operate the yacht. The Eclipse is the longest private yacht in the world at an amazing 164 metres. Designed by X-Architects, this 20-by-6.7 meter floating home includes an upper deck containing a concealed kitchen, living room and an informal dining area. The lower deck houses the bedrooms, bathroom and steering cabin. It also features a terrace, with spiral staircase access, that can be used as a sun deck. The interior is a blend of soft white tones, with contemporary furniture and chic bathroom fittings adding to the modern yet cozy ambiance. The architectural lighting makes this houseboat even more striking in the evening while it glides smoothly along the lucid waters of Mina Seyahi. The Iguana 29 Amphibious Yacht is a center console speed yacht with the ability to rise out of the water and drive along land. Iguana 29 does so not with wheels, but with a pair of retractable treads that lower into the water and carry the boat onto a hard surface. Alloy Yachts' Vertigo 220 Superyacht was created by Naval architect Philippe Brand. 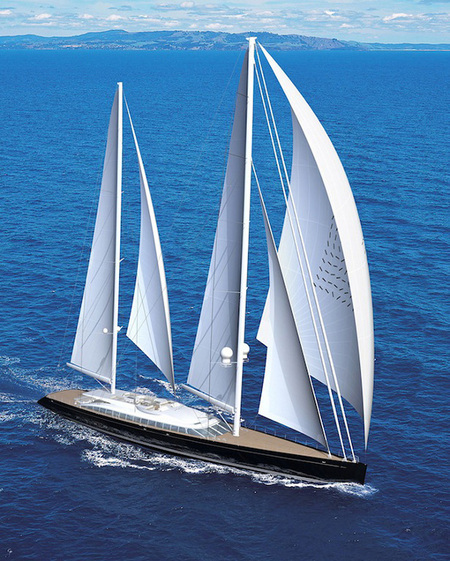 The immense 220-foot sailing yacht is luxuriously lined from bow to stern, capable of carrying captain, crew and company around the world in the highest of fashion. Oculus is a unique, 250-foot luxurious superyacht designed by Kevin Schopfer of Schopfer Yachts LLC. With an amazing look that resembles “the jaw and eye socket bone structure of large oceanic fish,” the exquisite yacht is able to accommodate up to 12 people in its modern, futuristically furnished salons. There is a bath, storage necessities, a cylindrical double height dining room, an elevator, bedchambers, and an amazing owner's suite on the second floor. 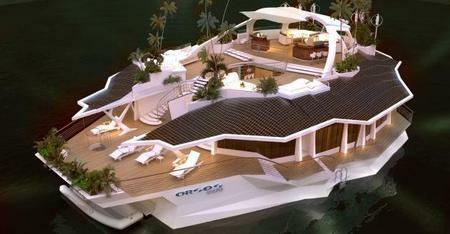 German company ORSOS Islands has created the prototype for this spectacular luxury floating home. With 10,000 square feet of posh living space, this yacht sleeps twelve and includes solar panels, skylights, a living room, kitchen, and even a home theater. 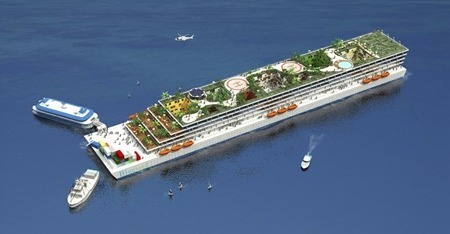 Paypal co-founder Peter Thiel has invested a large sum of money in a company called Blueseed, a venture that aims to create an offshore luxury barge that will essentially be a floating city. Located off the coast of California, just a short commute to Silicon Valley, this floating community is geared towards young professionals. Entrepreneurs and startups must apply to be considered for a spot on Blueseed. If they are approved, they will pay about $1,600 each month to live and work on the barge. If all goes according to plan, the barge will launch by the end of 2013.